The UK Carrier Strike Group (CSG) exercise was run by the U.S. Navy and involved the French, Danish and German navies. As well as personnel from HMS Queen Elizabeth (R08), members of the ships’ companies from HMS Prince of Wales (R09), Type 45 destroyer’s HMS Dragon (D35) and HMS Diamond (D34) and Type 23 frigate HMS Montrose (F236), also took part. Destroyers and frigates will be escorts for both HMS Queen Elizabeth (R08) and HMS Prince of Wales (R09) when they deploy. Those taking part in the exercise were visited by Rear Admiral Patrick Piercey, Director for Operations U.S. Pacific Command. «It was an excellent opportunity to review concepts of operations at different threat levels for CSG operations. Key themes discussed focused on the need for range for the Carrier Air Wing and future operational environments», said Colonel Philip Kelly RM, CSG Strike Warfare Commander. «The Admiral had a very keen understanding of the challenges we both face and was impressed with UK CSG’s progress thus far. I think we the UKCSG will be a welcome addition to any allied force as we bring significant combat power». The Admiral also visited HMS Queen Elizabeth (R08), touring the hangar and the ship’s Flyco, before stepping out onto the carrier’s four-acre flight deck. «It’s a great opportunity to discuss the UK’s return to Carrier Strike operations and how we can build our close operational partnerships across the globe», said Cdre Betton. Following the exercise, Cdre Betton hosted Vice Admiral Tim Fraser, Chief of Joint Operations, visiting from Permanent Joint Headquarters at Northwood, aboard HMS Queen Elizabeth (R08). Last year the CSG brushed up their skills when they embarked in the USS George H.W. Bush (CVN-77) for Exercise Saxon Warrior. The build up of CSG has also seen experts from the U.S. Navy and U.S. Marine Corps help to train and mentor the COMUKCSG team, who have also worked closely with the RAF. 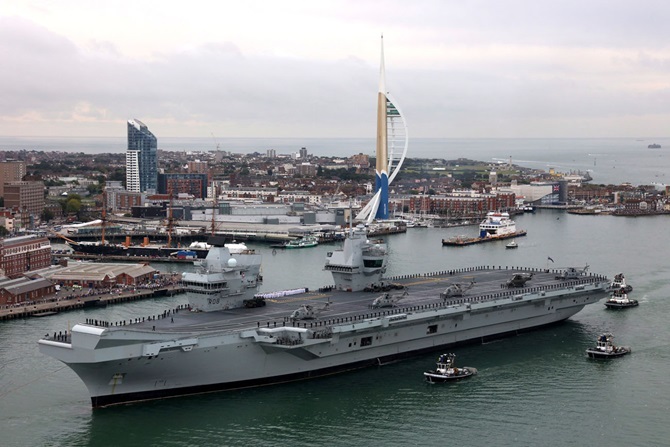 In the autumn of this year HMS Queen Elizabeth (R08) is set to deploy to the east coast of the USA for her first-of-class flying trials with the F-35B.